With September officially underway, one can’t help but have all things fall-related on the mind. September 22 marks the official start of autumn, and now is the time to plan all of the wonderful ways you’re going to enjoy the fall season. Of course, one of best aspects of fall is that moment the leaves begin to change colors. While a tree full of green leaves is exciting to see after a long winter, there is no denying the brightly-hued beauty fall brings to the woods around you. If you’re hoping to find ways to enjoy the new scenery during these few months, there’s plenty of ways to accomplish your goal without having to plan elaborate and expensive outings. 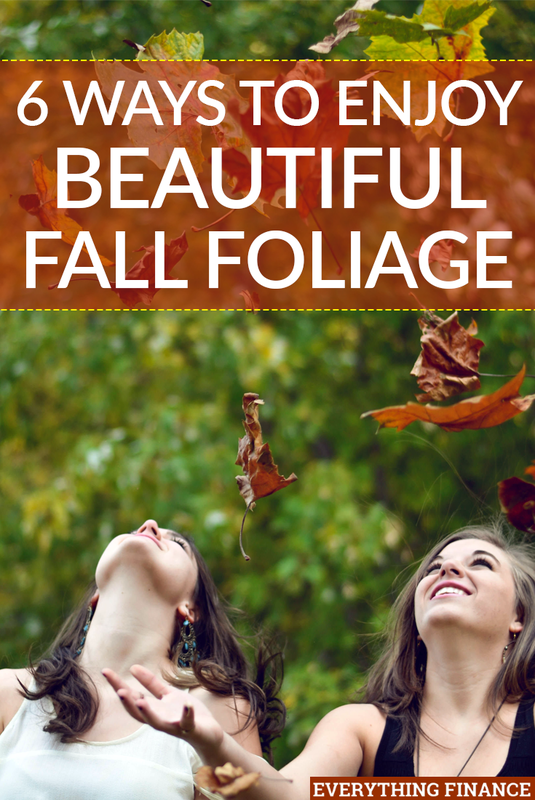 Instead, try some of these fun autumn activities to take in the beautiful fall foliage on a budget. If you already live somewhere scenic, or at least near a place that has wooded areas and lots of trees, then going for a drive can be a great way to enjoy the fall colors. It’s also a great way to get outside while staying warm, and if you’re lucky, you might be able to stop at a scenic overlook along the way. If you don’t have a car and it isn’t too chilly, you could consider trying this on a bicycle as well; the fresh air would be nice and you’ll have the bonus of getting in some good physical activity. As you probably know, apples grow on trees, and where there are apple trees, there are other saplings and lots of leaves, which means you’ll have a prime opportunity to see fall foliage. With the abundance of apple orchards in the U.S., especially in the Midwest, a great orchard shouldn’t be hard to find. Most apple orchards only charge a couple of dollars for entry; from there, you can decide how much you’d like to spend. If you choose to pick apples to take home, purchase snacks, or participate in various other activities, you’ll end up spending a little more. For the most part, however, picking apples is a fun and inexpensive way to enjoy the fall weather and scenery; it’s an enjoyable activity whether you chose to go alone, with friends, or with the whole family. Okay, I know you’re thinking that this sounds like a chore, but hear me out. Yes, this is one fall activity many of us with yards are forced to do multiple times during the autumn season, but it doesn’t necessarily have to be a chore. Not only will this get you outside to enjoy the crisp autumn air, it also won’t cost you a penny. Furthermore, at least for the first couple of times, raking leaves doesn’t seem all that bad; if you’re anything like me, you’ll just be so excited that those bright-red leaves exist in the first place. Moreover, you don’t necessarily have to make this activity all work and no play; if you’d like to bring out your inner child, rake those leaves into a pile and jump inside! If you live in the city or someplace that doesn’t have a great view of the scenery, getting away for a day or two can be the key to enjoying the beautiful fall foliage. Although this option may cost a little more than the others, it still won’t break the bank. With school back in session, and it being the start of football season, you may be able to find some great deals. Summer tends to be the peak of tourist season, which means hotels, rental cars and even various businesses and attractions will decrease their prices. You can find a budget bed and breakfast in the country for a quiet weekend to take in the fall surroundings. The beauty of autumn is that you don’t have to wait until it gets dark to have a bonfire. As the temperature decreases, you can plan a bonfire with friends and family in the late afternoon or evening where you’re sure to relish the changing leaves and fall foliage, and maybe a s’more or two. Furthermore, you shouldn’t have to shell out too much money to put this together; you may have to purchase wood (and bricks if you have to put a fire pit together), but other than that, you can stay on budget by having everyone chip in by bringing stuff for s’mores or hotdogs and drinks. Autumn is the season of festivals and they’re usually outside. Whether you choose to go to a pumpkin, beer, harvest-moon, wine, or simply an appropriately titled fall festival, you’re sure to find an evening of fun all while savoring the brisk weather and crunch of leaves. Like the apple orchards, most festivals charge a small price to enter, leaving how much you spend the rest of the day entirely up to you. Many festivals put on free entertainment and music, which means you can usually enjoy the event without spending a fortune. The best part of fall is the beautiful outdoors. There’s nothing better than finding the perfect tree, still full of leaves turned bright red, orange and yellow. And for those of us who delight in the new season, no sound is more fine than the inevitable crunch of leaves beneath your feet. Thankfully, no matter how you choose to enjoy the magnificent fall foliage, there are plenty of ways to do so all while staying on budget. What’s your favorite autumn activity to help you enjoy the fall foliage? Do you have beautiful scenery nearby, or do you need to travel a bit for it?